Built fresh in 2015, this 18 hole course offers a different challenge on each hole and provides a great family activity for all ages. Par 3 course set in approximately 16 acres of beautiful Cornish countryside with meandering streams and natural surroundings situated alongside The River Hayle. Newly opened in May 2016, our football golf course is a great family activity for old and young alike. Also good for party’s and team building. Our Clubhouse/Tearoom “Tee Time” serves fresh ground coffee, tea and hot chocolate. During the busier times we also sell a great selection of locally baked cakes. Adjoining the shop is an outdoor play area which has a fence around the perimeter to keep your little ones safe. 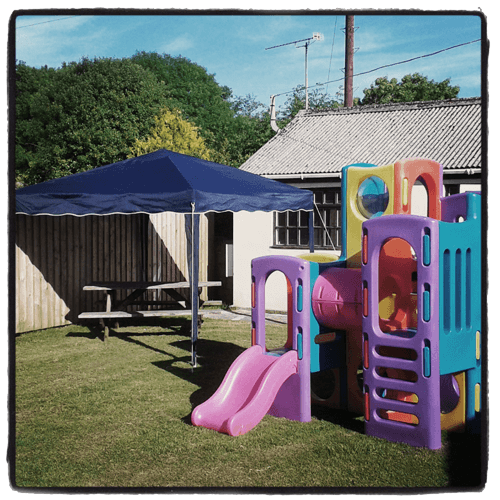 The play area has been very popular with children’s parties. Our facilities have recently been refurbished and now have a baby changing unit and disabled access. Penwith Pitch & Putt first opened on 31st May 1985. The previous owners, Kathy and Paddy Corrigan, bought the land in 1978 from their Great Uncle, Stephen Mitchell and then spent 7 years converting the smallholding into a pitch & putt golf course. They ran the business until May 2012 when ill health sadly forced them to sell. The current owner, Dave Corrigan, bought the business from his parents so as to keep it in the family. Since Dave has had ownership many improvements have been made, including renovating the shop and toilets (which now enables disabled access), creating an outdoor play area (great for children’s parties! ), redesigning the pitch & putt and crazy golf courses, and building a brand new football golf course. Now in it’s 4th decade of operation, Penwith Pitch & putt continues to provide fun activities the whole family can enjoy. Our Crazy golf course was built fresh in 2015 and has 18 holes, each offering a different challenge. Crazy Golf has proved to be a very popular family activity suitable for all ages. Our 12 hole, par 3 pitch & putt course is set in approximately 16 acres of beautiful Cornish countryside, with meandering streams and natural surroundings situated alongside The River Hayle. The course has holes ranging from 57yds - 120yds and provides an exciting challenge for all ages and abilities. We supply everyone with a set of clubs (iron and putter), scorecard, pencil, tees and a ball. Football Golf uses the same rules as golf but instead of using a golf club and ball players use their foot and a football! Our 9 hole Football Golf course was newly opened in May 2016. Each hole has an obstacle which sort of combines Crazy Golf too! It's a great fun game for old and young alike. Also great for parties and team building.